Data Breaches have consumed every day news headlines in recent years and 2018 is showing to be no different. As widespread as the breaches of 2017 seemed, a new year has brought forth even more vulnerabilities and fines to multiple companies. As it stands now, 2018 is shaping up to be a record breaking year as fines are levied on businesses who knowingly and unknowingly incur a data breach. While larger companies always seem to make the headlines, they do not make up the majority of data breaches year after year. According to the Verizon Data Breach Investigation Report, in 2017 61% of breaches hit small businesses, which is a spike upwards from 53% the previous year. $100,000.00 fine was given to AMP Global Clearing for a data breach. You can read the article here. $100,000.00 fine was announced for a medical records company named FileFax in Northbrook, IL. You can read more here. 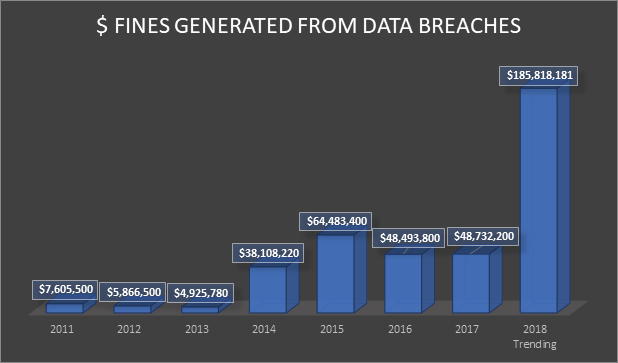 As you can see in the chart to the right, data breach fines have shown to jump dramatically since 2013 and the projected 2018 impact thus far shows no signs of slowing. We’re almost through the homestretch of 2018 and unfortunately the threat of data breaches has not slowed. Considering the amount of breaches that we have seen in 2018 alone, businesses cannot afford to be unprepared should a breach compromise their data. The two biggest breaches we have seen this year have come from Facebook and Uber. While the extent of the breach at Facebook is still being analyzed, we can expect the fines to be hefty moving forward. Uber however, encountered a breach that amassed fines just north of $148,000,000 and that figure does not even take into account the millions more they lost in reputation. Here are some updated statistics on where fines are trending by the end of the year and some recent fines levied on businesses in the United States. 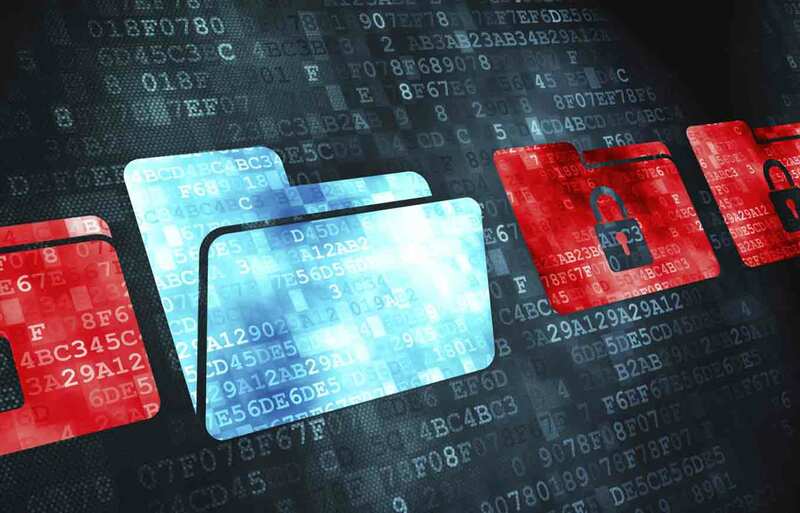 Actively managing your confidential business information will help mitigate the risk of your business experiencing a breach. From storing physical records at an off-site records storage facility to installing a shred cart or console at your office for recurring document shredding service, placing high value on protecting the information assets that are vital to your business can be all the difference when it matters most. Williams’ commitment to your business includes protecting it at all stages, so we’ve partnered with CSR, the national experts in data breach reporting, to provide your organization with its award-winning CSR Breach Reporting Service ™. Take a look at this video to see just how Breach Reporting works and Williams experts can guide you to a tailored solution that makes sense for your business. Call us @ 888.920.4549 or Request a Quote to learn more.